Watch the new author trailer for Angela's latest book on Youtube. 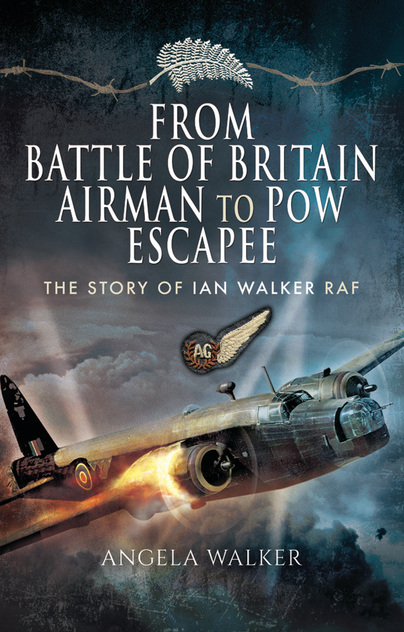 You'll be £8.00 closer to your next £10.00 credit when you purchase From Battle of Britain Airman to PoW Escapee. What's this? This is the Second World War story of a champion cyclist turned airman who lived to tell the tale against almost impossible odds. A New Zealander in the RAF, Ian Walker took part in the Battle of Britain before transferring to Bomber Command and surviving three plane crashes in his Wellington bomber. The last of these saw him crash land in enemy territory, where he was eventually captured and taken prisoner. Confined within the claustrophobic walls of a POW camp, he hatched a plot with a fellow inmate to escape. This they achieved, almost miraculously, in broad daylight. Living on basic rations, they navigated the enemy wilds until they were captured, yet again, and taken back to prison. After languishing in POW camps and hospitals for more than two years, Ian had the good fortune of being placed on a list of injured men to be exchanged, man for man, with German prisoners. The little-known story of the history-making exchange that took place in Barcelona in October 1943 is detailed here, describing how thousands of allied and axis prisoners were safely returned to their homelands in the midst of war. his past. Her book commemorates the efforts of all New Zealand’s wartime airmen who, like her father, made significant contributions in the fight for allied victory. An unusual story told well, and I am happy to recommend it. This is an affectionate story of an inspiring father by a loving daughter. It is a very interesting and moving account. Very Highly Recommended. gold medalist, inspired in her own sporting endeavours by her father, a champion cyclist who narrowly missed Commonwealth Games selection himself, cycling on a leg that had been injured during the war. The publication of this book represents the culmination of a real labour of love on her part, commemorating the life and career of her late father and celebrating him as an icon of endurance and survival.